Published Jun 23, 2017 by Pearson IT Certification. Part of the LiveLessons series. Routing and Switching 200-125 Exam Prep LiveLessons Library gives you the edge you need to pass the Cisco CCNA Routing and Switching exams. 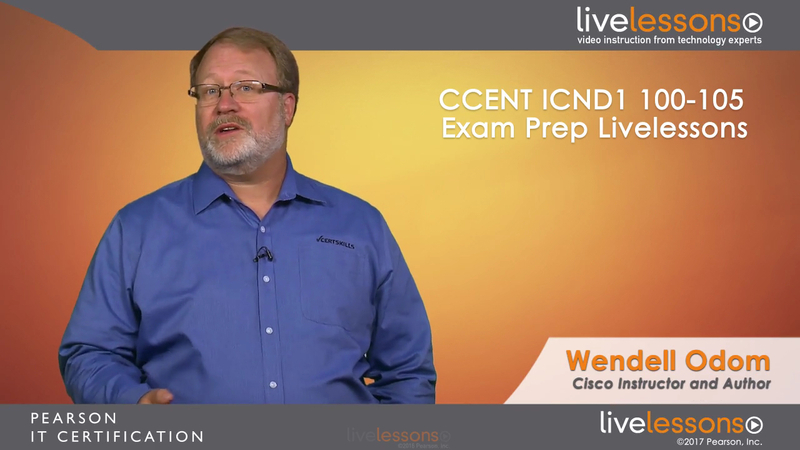 Wendell Odom, best-selling author of the CCENT and CCNA Official Cert Guides, provides more than 17 hours of video training detailing what to expect on the CCENT ICND1 100-105 exam, the CCNA ICND2 200-105 exam, and the Routing and Switching 200-125 exam. The course covers common misunderstandings people often make when taking the exams plus more than 6 hours of sample question review. This is an essential course for anyone interested in passing the CCENT ICND1, CCNA ICND2, or 200-125 CCNA combined exam. Routing and Switching 200-125 Exam Prep LiveLessons Library provides more than 17 hours of video training detailing common exam traps, pitfalls, and difficulties on the Cisco CCENT ICND1 100-105, CCNA ICND2 200-105, and CCNA 200-125 exams. This product focuses on giving you the tools you need to pass these exams. Features include background information on the exams, a deep dive into common mistakes and misunderstandings people make when taking the exams, and exam walkthroughs with sample questions so you can see firsthand the types of questions you’ll encounter in the testing facility. Best-selling author and expert instructor Wendell Odom explores essential information about the Cisco CCENT and CCNA Routing and Switching certifications, such as what to do if you get stuck on a question, what to expect in the testing facility, and how to manage your time. Module 2 of each course is dedicated to helping you preemptively learn about common misunderstandings people make about the exams; these sections also focus on commonplace mistakes that people make. Module 3 of each course takes you on a deep dive into the types of questions you’ll encounter for each domain in the exam. In this section, you will have the opportunity to assess sample questions and see firsthand how the author solves each one while detailing why the right answer is correct and how to avoid pitfalls. This course is meant to help you prepare for your exam and identify areas of weakness, while improving your conceptual knowledge and hands-on skills. The CCENT ICND1 100-105 Exam Prep LiveLessons video course is a secondary resource for the CCENT ICND1 100-105 exam and assumes that the user has already studied the basics of each CCENT exam topic. This product is designed to help you troubleshoot where you might go wrong on the exam and to clarify common misunderstandings. It does not cover every objective on the exam and should not be used as a sole study resource. For full coverage of the exam, please reference the CCENT/CCNA ICND1 100-105 Official Cert Guide or the CCENT ICND1 100-105 Complete Video Course. The CCNA ICND2 200-105 Exam Prep LiveLessons video course is a secondary resource for the CCNA Routing and Switching 200-125 exam and ICND2 200-105 exam and assumes that the user has already studied the basics of each CCNA exam topic. This product is designed to help you troubleshoot where you might go wrong on the exam and to clarify common misunderstandings. It does not cover every objective on the exam and should not be used as a sole study resource. For full coverage of the exam, please reference the CCNA Routing and Switching ICND2 200-105 Official Cert Guide or the CCNA Routing and Switching ICND2 200-105 Complete Video Course with Practice Test.